Classic spring weather. We were all set to plant the very early tomatoes and cukes in the sliding tunnels and then they dropped the low for Saturday night down to 22 degrees. Nope, we will just wait until Monday to put them in the ground and will instead move them back into the greenhouse for safe keeping. The floating row covers will come back out from their summer storage to cover lettuce and some of the flowers. The only thing we can’t do much about is the blueberries that are beginning to bloom, we will lose some early fruit but not the whole crop as many buds are not open yet. Cold, wet day so what is more perfect than to be in the greenhouse seeding the big pepper array for this year. Painstaking and tedious, Jennie and Lacey are up to the task. Keeping the 28 varieties straight and in the proper numbers takes patience, nearly 4000 seeds. A few new interesting varieties this year including four special datil pepper seeds, yes 4, given to us by a fellow whose family has been in St. Augustine Florida since the 1500’s where the datil pepper has been grown by the Minorcan community since the 1700’s and is central to their cooking. Each plant will have a name and armed guard. Remember the picture of the Christmas lights in the flowers to add just a bit of additional heat when it got down to one degree back mid February? 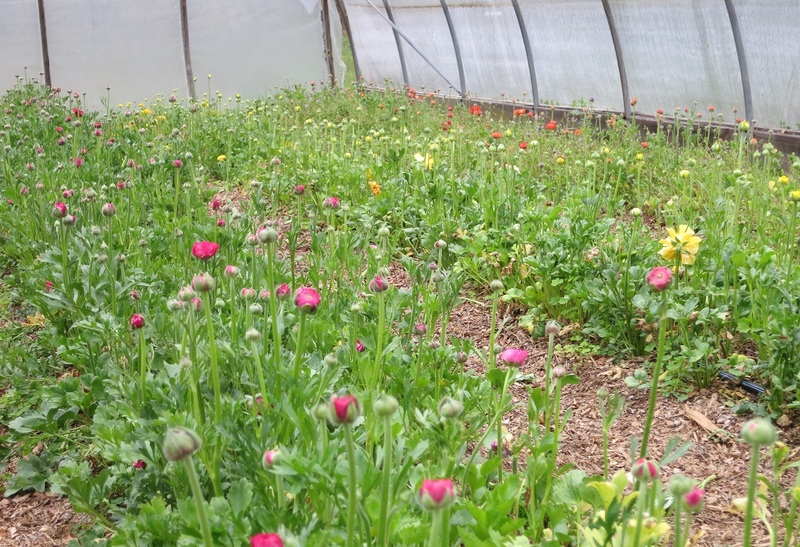 Here are the results, lots of beautiful Ranunculus for now, Easter and later.